For the past 2 years we’ve been supporting Masimo with UX/UI sound design across their complete range of smart medical devices. 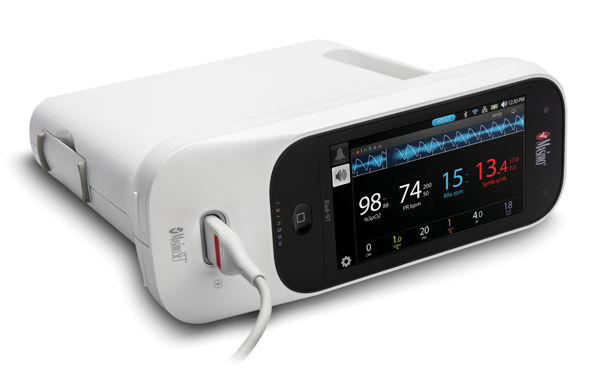 Masimo is a California-based company who develop and manufacture non-invasive patient monitoring technologies. They are known as being one of the most innovative companies in the medical industry, and are currently the leading producer of hospital pulse oximetry sensors and devices. Work throughout 2018 has involved a close collaboration with world-leading alarms expert, Professor Judy Edworthy. More details on this to come later..
A few weeks ago Henry was asked by Skillshare to create an online course on ‘Sound Design in UX’ - there wasn’t anything like it on their platform, despite there being a clear demand for it. So Henry duly had a go and ‘Sound Design in UX: An Introduction for Designers’ is now live! We’d welcome anyone who has an interest to check it out. Check out the introduction video below for a preview, and for anyone interested to view the course you can use this unique referral code (https://skl.sh/2CkzLOZ) to get 2 months Premium membership free. Skillshare is a fantastic online learning community, featuring thousands of classes in design, business, tech, and more. Back in late 2016, we were thrilled to be able to support Thalmic Labs and their ground-breaking ‘Focals’ smart glasses. Thalmic Labs, who have recently rebranded as North to coincide with the launch of the Focals, are based in Kitchener, Canada. The Focals is a product with the potential to redefine the wearables category – creating stylishly smart glasses that simply blend into our everyday lives, encouraging us to limit our time spent staring down at a computer screen. For the sound design, we would collaborate with the UX Design team at a time when they were at a preliminary stage of product design thinking. They needed to understand the value of sound design as part of their interface, so my exploratory work involved creating unique UI sound sets. Sounds that would compliment and enhance the subtle interactions experienced within the lens interface. UI sounds that would range from a start-up, to a notification alert, to a subtle keypress. The Focals come in either the round or classic style, and are fully integrated with Amazon Alexa. They look absolutely fantastic and it will be interesting to see what impact the smart glasses make once they become available later this year. We’re very happy to share the news of our collaboration with Xiaomi and their superb range of Mi phones. Our collaboration involved a complete brand refresh of the core Mi sounds, including the renowned default Mi ringtone and a host of default notifications. We also updated the Mi system sounds including the vitally important camera sounds, designed to reflect the advanced camera technology. Other system sounds included the low battery sounds, charging sounds, lock/unlock sounds, and keypress sounds. All our work has been featured since MIUI9, a major software update for Mi phones released last year. Mi phones shipping with the latest sounds include the stunning new flagship Mi MIX 2S and the popular Redmi Note 5 Pro. Back in early 2016 we had the pleasure of working with the design team behind the Otto Smart Lock. Otto are a startup with substantial investment based out of San Francisco - and after 4 years of research, design, engineering and testing, the company recently announced their flagship product, the Otto Smart Lock. There are quite a few smart locks already in the market, but the Otto lock definitely sets a new benchmark. Its a beautiful device, and by far the most advanced and best looking out there. The sound design needed to reflect the high quality design, ensuring any sounds you hear would subtly blend into the overall UX, and only take as much attention as necessary. Key sounds included the lock and unlock pairing, which formed a vital part of the UX and branding. For any requests to hear the sound design work for the Otto Smart Lock, please contact us directly. Meanwhile you can watch the Otto product video below. The lock retails at $699 and will be available to buy this Autumn. In May 2017 Henry gave a keynote talk on UX/UI Sound Design, as part of the The Next Web tech conference in Amsterdam. It was a fantastic event and he was thrilled to share the stage with such an array of great speakers. During Henry’s talk, he highlighted a clearly defined set of principles for successful UI sound design, whilst championing the case for bringing UI sound design deeper into the design process. He also discussed the delicate relationship between UI sound design and audio branding, and how we, as sound design practitioners and marketers, can embrace the challenges ahead as our world becomes more dependable on UI sound. Back in 2016 we worked with the awesome guys at Wayfindr - creating sound assets required for the Standard, participating to the brand development and user testing, and helping to establish a sound strategy going forward (through the Wayfindr Alliance). To date, we have designed the two vital notification sounds used within the Wayfindr Demo App (and provided as part of the Standard). As part of the brand refresh by Moving Brands we have also provided an audio logo, to be used for any animation lock-ups. The sounds (and the story behind them) can be heard from this article Henry wrote on the Wayfindr blog (https://www.wayfindr.net/creating-sonic-identity-wayfindr/). There is a lot more to come with this, so please stay tuned and we’d urge you to read up on what Wayfindr is all about. Wayfindr is a fantastic project that supports vision impaired people by creating an Open Standard for indoor navigation. The video below gives a nice and simple overview of Wayfindr. Henry wrote this article to highlight the importance of sound design within UX and UI - It was written for The Awwwards, who recognise the talent and effort of the best web designers, developers and agencies in the world. This was an article Henry wrote for A Sound Effect, highlighting some of the key factors of what makes a successful audio brand. The article was largely based on Henry’s experience of working for over a decade at Nokia, one of the most recognised audio brands in the World. A short promotional video for Sceneskope in which we created the sound design (including voice over) and background music. The inspiring Microsoft Cities Unlocked/Guide Dogs project (recently renamed as Microsoft Soundscape) uses 3D sound as a navigational aid for the blind. Henry would lead the sound design development; creating the sound design assets needed whilst developing the audio language and identity. Music Schools collaboration project in which Henry led from conception to realisation - the idea was to work with students from the most prestigious music schools around the world to create ringtones - to be pre-loaded into our upcoming Lumia devices. Locations included UK, South Africa, China, India, and Mexico. Worldwide crowdsourcing contest to create ringtones, using the Audiodraft platform. The project was nominated for an Audio Branding Academy Award 2012 with Nokia's "Branded Globally - Relevant Locally" submission. Henry led the project in 2013 to refresh the core audio brand assets for Nokia, including the Nokia Tune, default message, calendar reminder, email alert, and clock alarm. The project was featured as Nokia's submission to the Audio Branding Academy Awards 2013. Link to the Microsoft Phones Design Team official Soundcloud page. Includes large collection of ringtones and music tracks, created and curated by Microsoft Phones Sound Design Team.